The third book in the Franklin School Friends series focuses on Izzy Barr. While her friends Kelsey Green and Annika Riz love reading and math, respectively, Izzy lives for sports - mostly baseball and track. Though she is the only athlete in her circle of friends, she is not the only one at home. She and her half-brother, Dustin, frequently compete for their dad's attention, and to Izzy, it always seems like Dustin's games take precedence over hers. Rather than expressing her feelings, however, Izzy tells her dad that his presence makes her nervous, discouraging him from even attempting to attend her games. It is not until she faces the possibility of running an important race without her dad there to see her that she realizes it might be best to speak the truth. When it comes to school stories for younger kids, there is no better author than Claudia Mills. As Andrew Clements does for the upper elementary audience, Mills demonstrates a true understanding of the concerns of her readers, and of the seemingly mundane things that matter deeply to third graders. The characters in this series are wonderfully normal kids who have their flaws and make their mistakes, but at their hearts, they are good friends who strive to do the right thing. Izzy's struggle to communicate with her dad, and her rocky relationship with Dustin are problems that any child her age could have, and the missteps she makes on the way to improving the situation are very true to life as well. There is only one thread of the story that doesn't really work. Izzy begs for new sneakers, then discards them, only to want them back again later. It seems like this is being set up as a lesson on materialism or selfishness, but instead the sneakers almost become a symbol of Izzy's relationship with her dad in a way that doesn't quite match the message of the rest of the book. This is probably a blip on the radar for most readers, but it was distracting from the central themes of the story. 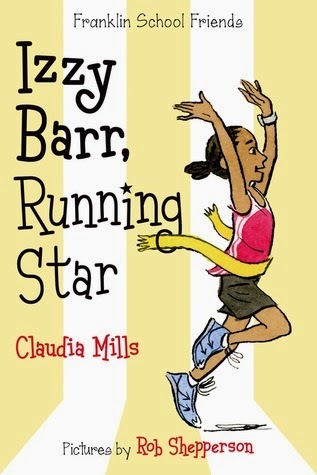 Izzy Barr, Running Star is a great read-alike for the new Sylvie Scruggs series, which also focuses on family and friendship from the point of view of a sporty girl. While it initially seemed that this third book was the conclusion of a trilogy, it turns out that a fourth Franklin School Friends book will be published this Fall: Simon Ellis, Spelling Bee Champ.